I recently went upstate to help my mom out with her new house, and while I was home I took a break to go visit my grandparents. My grandfather is a man of few words, and usually contributes little more to dinner table chats than some talk about his vegetable garden. One topic that always gets him talking a blue streak though, is World War II. I don’t know about you, but I think war-time stories are actually pretty fascinating, so when the conversation turned to what life was like for he and his family back then, I was thrilled. My grandfather was born in Germany in a farming community where he and his family worked building homes and barns for the neighboring farmers. During the war when food was rationed, items like sugar, chocolate, & coffee became rare luxuries that were extremely hard to come by for civilians. Fortunately, my grandfather had family living in the US who would send care packages with items they could trade with their neighbors to help them get by. When my grandfather was fourteen years old his father refused to join the nazi party and was sent away to work in a ball bearing factory in Schweinfurt. This left my grandfather, the oldest child in a large family, in charge. He told me that real coffee was so hard to come by, and in such high demand, that their local butcher once traded them 150 lbs of beef for just one pound of coffee! They grew a lot of their own vegetables, but didn’t usually get to eat much meat, so those coffee care packages meant more to their family than most of us can even understand. After the war my grandfather and many of his siblings moved to the US and settled in upstate New York, where I grew up. When I heard Grandpa’s story, it reminded me of another story from World War II that I recently read about, the story of the Brooklyn Blackout Cake. I’ve actually been thinking about making this cake and sharing the story with you for a while now, but until my visit home I hadn’t had the inspiration I needed to take on this iconic cake. In the U.S., just as in Germany, food was being rationed during the war and items like sugar, coffee, & chocolate were hard to come by. Chocolate was especially in short supply because much of what was produced at that time was reserved for the war effort and sent to the front. In Brooklyn, the Rockwood chocolate factory was so busy making chocolate for the war that they became the second-largest chocolate maker in the country, second only to Hershey’s. Rockwood’s government contracts made up so much of their business in fact, that about a decade or so after the war ended and the contracts expired, the company went out of business. Workers in the Brooklyn Navy Yard, only a few blocks from the chocolate factory, were surrounded by the constant smell of chocolate drifting over from Rockwood, which was a huge tease since they had such limited access to chocolate bars. At the peak of the war, the Brooklyn Navy Yard was one of the most important naval warship building yards in the U.S., and employed over 70,000 people working in shifts 24 hours a day. The navy yard was so important to the war effort that enemy U-boats would sneak through the waters around New York hoping to sink some of the completed ships as they sailed out. Battleships usually left the yard at night under the cover of darkness, but New York’s bright lights served as an accidental backdrop to the black silhouette of moving ships. After a few tankers were sunk in New York Harbor in January of 1942, the Civilian Defense Corps decided action needed to be taken to protect the ships. Temporary blackout drills were common in European cities to protect them from air raids, but in June 1942 much of New York, especially Brooklyn, went through a permanent ‘dim-out’ that lasted through to the end of the war. City lights were turned off, windows were covered with heavy material, and vehicles drove at night without headlights or street lamps, all to make sure no light could be seen from enemy U-boats. Even the lights of Time’s Square and the Coney Island amusement park went dark through the war. During Brooklyn’s blackout era, there was another chocolate confection maker near the Navy Yard, and this one was open to the public. Ebinger’s Bakery opened their first store in 1898 and soon swelled to a baking institution with 54 locations throughout Brooklyn and Queens. They made all of their treats from scratch daily, and gave their shops an air of authenticity by hiring shop girls with German accents. Before the war they were selling a pudding-filled three-tiered dark chocolate cake, but when the Civilian Defense Corps instituted their lights out policy, Ebinger’s decided to name their cake the “Brooklyn Blackout Cake” to show their support for the city they called home. 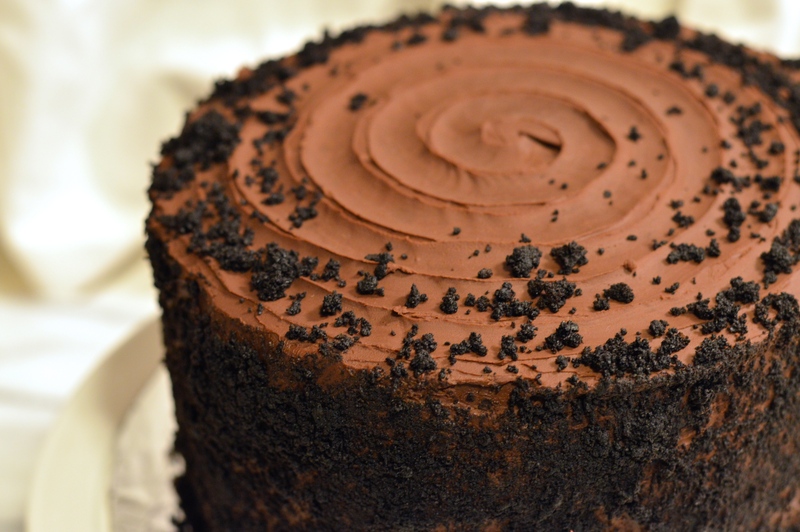 Whether it was the deep dark chocolate-on-chocolate flavor, or their close proximity to the Navy Yard where workers were constantly smelling chocolate they couldn’t have, the cake was a huge hit. The name stuck well after the war and the cake became an iconic confection, well-known all over the country even though the Ebinger’s chain never left New York. Unfortunately, a few decades later, Ebinger’s fell victim to a consumer obsession with diets and health, poor business management, and the country’s fascination with convenient supermarket shopping. The short shelf life and unhealthy ingredients in their home-baked treats couldn’t compete, and Ebinger’s went out of business on August 27, 1972. Their secret family recipes were never released, and though many have tried to replicate them, no one knows the exact details of those original recipes. Since they went bust more than a decade before I was born, I’ve never actually tasted a genuine Ebinger’s Brooklyn Blackout Cake. If you’re looking for the real, true, authentic recipe, you’ve come to the wrong place. Many bakeries and blogs have tried their best to come up with a close approximation, but since I’ve never tasted the real thing, I decided I was within my rights to take some liberties. 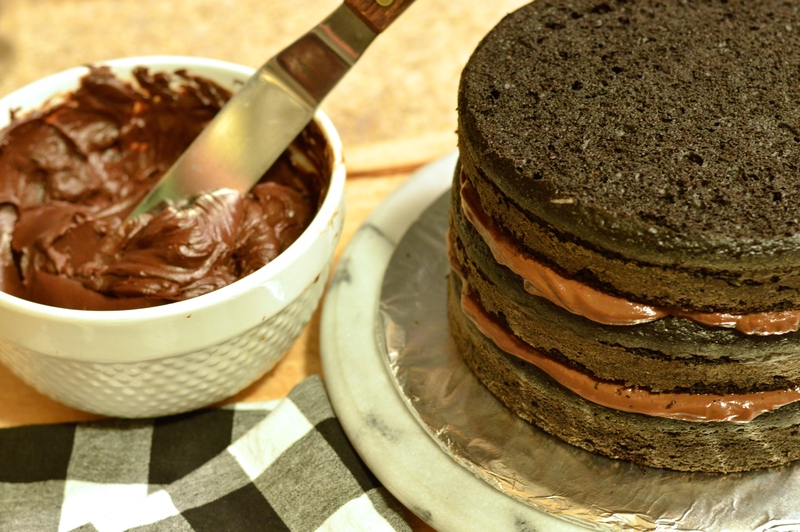 According to food historian Molly O’Neill, a true Brooklyn Blackout Cake consists of “…three layers of devil’s food cake sandwiching a dark chocolate pudding with chocolate frosting and sprinkled with chocolate cake crumbs.” I followed her guideline, but went ahead and used my own recipes for the three components. 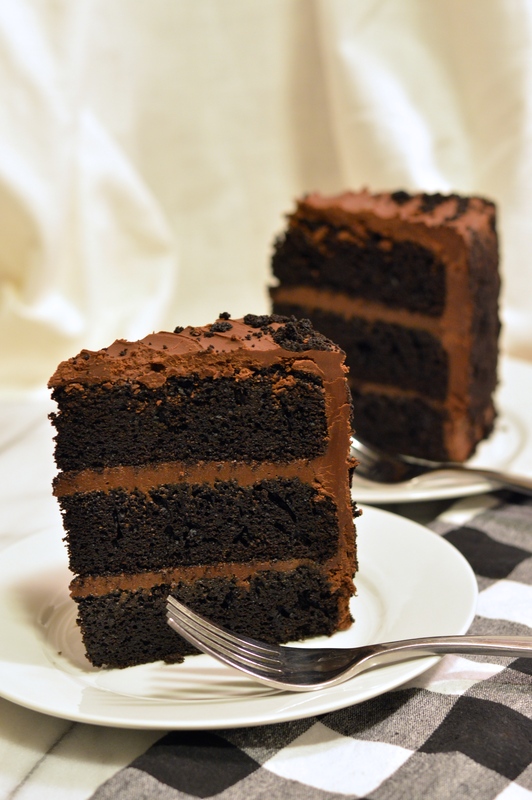 I used my favorite recipe for Devil’s Food Cake but, in place of natural cocoa, I substituted a mix of dutch-process cocoa and ultra-dutched black cocoa to give the cake a deep dark “blackout” flavor. If you’re not familiar with black cocoa, it’s what’s used in Oreos to give them their iconic dark chocolate flavor. It can sometimes be a bit overpowering in a cake though, so I mixed it with dutch-process cocoa to mellow it out a bit. 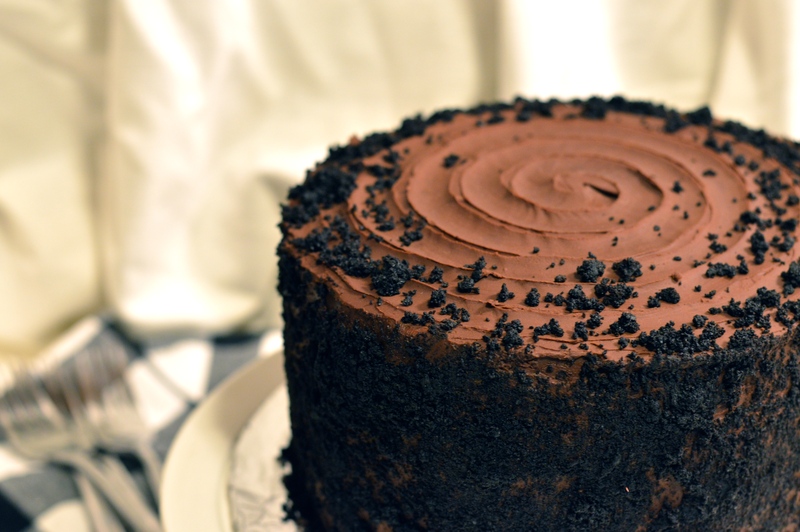 The end result is an impossibly chocolatey cake that is literally black in color. If you don’t have or can’t find black cocoa (available here), feel free to just use dutch-process cocoa. I’m positive you’ll have amazing results either way. For the pudding filling, I decided to add some espresso powder to deepen the chocolate flavor, and to bring a bit of coffee into the cake that I was inspired to bake by my grandfather’s story. 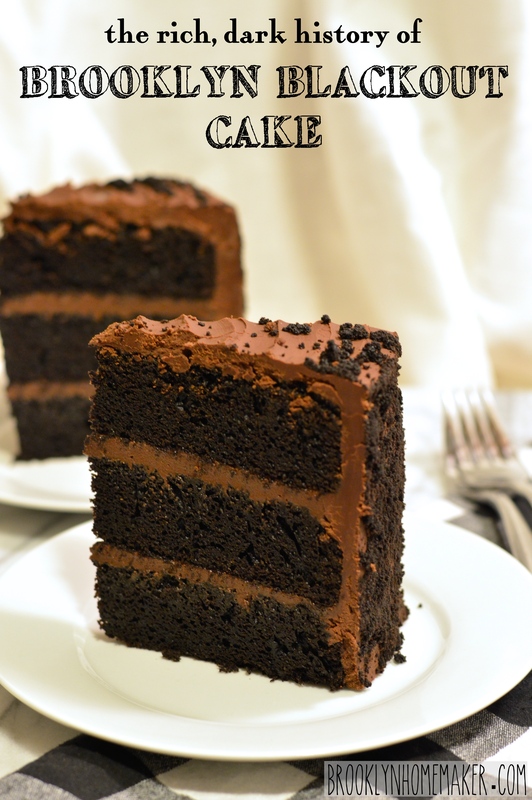 If you’re not a coffee fan you could leave it out, but together with the other components, you get just a subtle hint of coffee that backs up the dark chocolatiness of the rest of the cake. To top it all off, I iced the cake with a thick, rich dark chocolate ganache. Then I covered the sides of the cake with crumbs while leaving most of the top clean to show off a swirled design in the icing. When making a layer cake, especially one consisting of more than two layers, I think it’s really important to level each layer of cake before assembly. I think it makes for a much more professional looking, impressive, and beautiful cake. I also like that you get an opportunity to taste the cake before serving to be certain no mistakes were made. Luckily, in this recipe, the excess cake gets put to good use too. To be perfectly honest, this cake is a LOT of work. Ebinger’s was making this in commercial production bakeries with lots of help, but making this yourself is a bit of an undertaking. 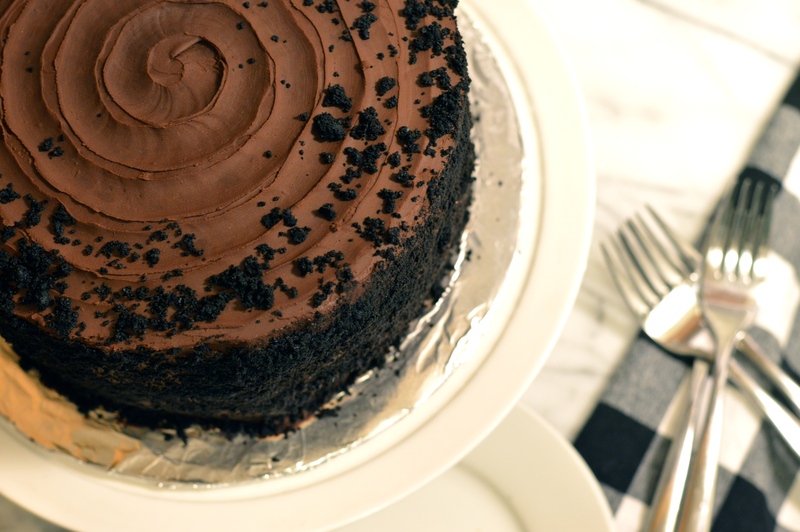 If you’re up for the challenge though, the end result is unbelievably delicious, incredibly moist, and outrageously chocolatey. 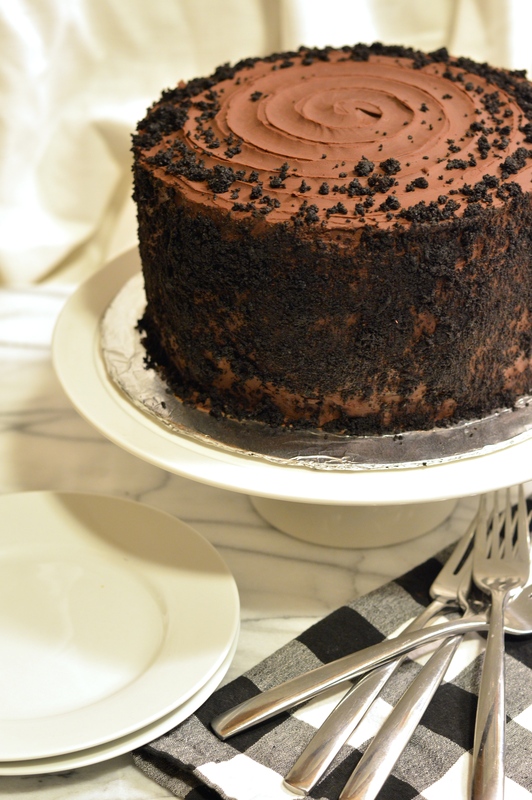 If you are as big of a fan of chocolate as I am, you’ll go crazy for this cake. Preheat oven to 350 degrees. Butter three 8 inch round cake pans, line bottoms with parchment paper, butter paper, and dust pans with flour. 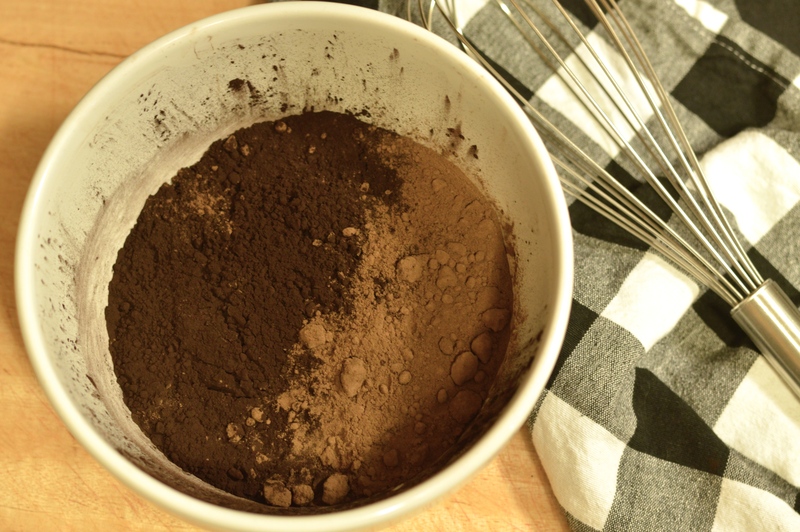 Whisk together cocoa powders and hot water until smooth. Sift together flour, salt, baking powder, and baking soda; set aside. Beat oil and sugars together on medium-low speed until combined. Add eggs, one at a time, beating after each addition. Beat in vanilla and cocoa mixture. Reduce speed to low. 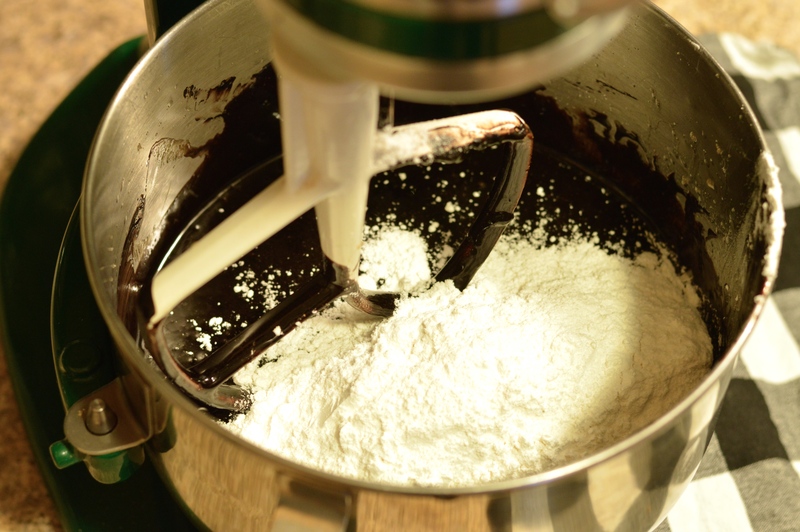 Add flour mixture in two batches, alternating with buttermilk and beginning and ending with flour. Beat until just combined. Divide batter between pans, and bake until a cake tester inserted into centers comes out clean, 40 to 45 minutes. Transfer pans to a wire rack to cool for 15 minutes. Invert cakes onto rack, peel off parchment, and let cool completely. In a small heavy saucepan, mix sugar, cornstarch, espresso powder and salt. Whisk in milk. Cook and stir over medium heat until thickened and bubbly. Reduce heat to low; cook and stir 2 minutes longer. Remove from heat and stir in chocolate until melted. Transfer to a bowl; stir in vanilla. Cool slightly, stirring occasionally. Press plastic wrap onto surface of pudding. Refrigerate, covered, at least 2 hours or until cold. Heat cream, sugar, and salt over medium heat until just on the verge of boiling. Place chopped chocolate in a heat proof bowl and pour hot cream over it making sure all chocolate is submerged. Let sit for 2 or 3 minutes, and whisk until completely smooth and incorporated. Add vanilla and whisk well. Cover and cool until thick and spreadable. You can try to speed this up in the refrigerator, but check it frequently and be careful not to let it get too cold or it won’t be spreadable. To assemble cake, make sure all layers, filling & icing are cool or cold. 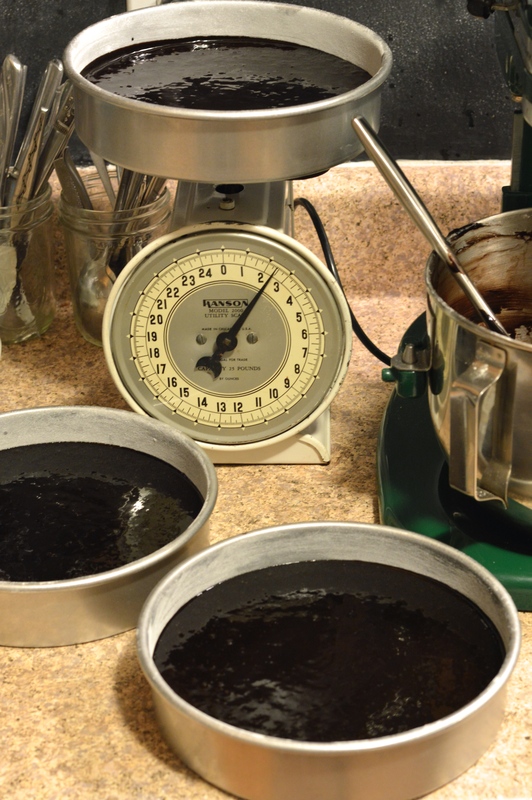 Remove the domed tops of the cake layers with a cake leveler or sharp bread knife. With clean hands, crumble up reserved cake domes into fine, relatively even crumbs, and reserve for decorating use. Place one layer on a cake plate, serving plate, or cake board. Evenly spread half of the pudding over the first layer. Top with another layer and remaining pudding. Top with third layer. 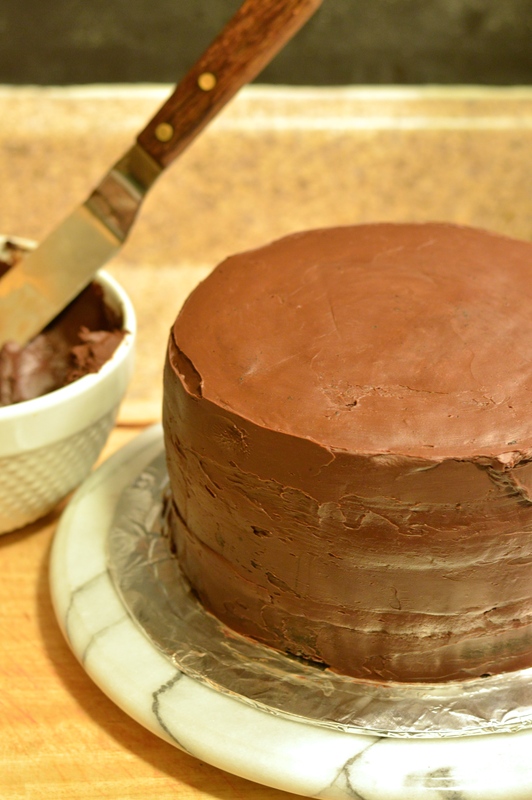 With an icing spatula, spread a thin layer of ganache over top and sides of cake, trying not to squish the pudding out from between the layers. This should take about 1/3 of your ganache. Be sure to fill in any gaps between layers and make the sides and top smooth and flat as possible. This thin layer of icing is referred to as the “crumb coat” and is meant to seal in any crumbs so they’re not seen in your final layer of icing. Refrigerate cake for 15 minutes. Spread most (or all) of remaining ganache evenly over top and sides of cake, trying to get as smooth a surface as possible. If desired, reserve some ganache for piped decoration, otherwise, slather it all on. Press the crumbs against sides of the cake until the sides are well covered. You can decorate the top with a swirl design using a small icing spatula, leave it flat and smooth, pipe a border or design, or cover the top with more crumbs. This cake is at it’s best the day it’s baked, but can be covered and refrigerated for up to 2 days. If refrigerated, it will need to come up to room temperature before serving.